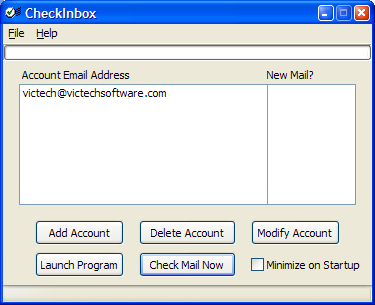 CheckInbox checks multiple POP3 email accounts. With five forms of alerting you to new emails, CheckInbox makes sure you are immediately notified if you have new email. It supports user settable check frequency, as well as options for starting up to the system tray. Version 1.7 will now recreate the tray icon if Explorer crashes (! ), and fixes a bug in the "launch program" settings. CheckInbox minimizes to your system tray, so it is out of the way while you work. CheckInbox comes with a 30-use trial period. This program requires the Visual Basic 6.0 runtimes (MSVBVM60.DLL) and the Microsoft Windows Installer to install. Note: Please uninstall your current version before installing version 1.7! CheckInbox 1.7 is shareware, if you like it, please order it. See a Screen Shot, and a Screen Shot in XP.